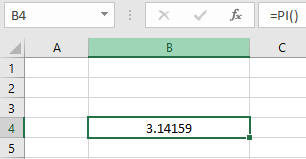 In this article, you will see how to round numbers in Excel without formula. You will get to see a number of processes to round up, round down and chop off decimal numbers in Excel. Here we will mainly see the options which include the built-in features. The processes are very simple, you can choose any process that you want. Excel has the built-in feature under the Home tab from which you can easily round up or round down your numbers. Here in this example, we will work with the value of PI. We will round this value into different decimal places. To insert the value of PI in your worksheet. Write, =PI () in any cell. As you can see this value has 14 decimal places. To decrease the decimal places, first move your cursor to Home tab and under the Number section, you will find the Decrease Decimal option. Click it after selecting your cell. You will see the decimal places are reduced. The decimal places get deducted the number of times you click on to this option. So, to convert this value to a 5 decimal place number you have to click it 9 times as the number contains total 14 decimal places. Let`s work with the number 3.14159. IF you want to increase the decimal numbers from 5 decimal places to 7 decimal places, select the number first and click on to the Increase Decimal option two times under the Home tab. You will see 2 decimal places are added to your number. After pressing it two times you will get the below result. 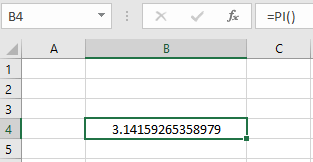 Let`s work with the value of PI again which has 14 decimal places. Here we will round the number by selecting the decimal places specifically. 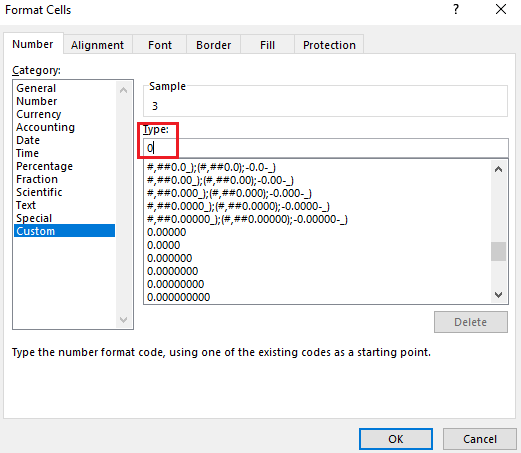 To open up the Number Format, select the specific cell for which want to do the formatting. Now select the Number Format option under the Home tab. 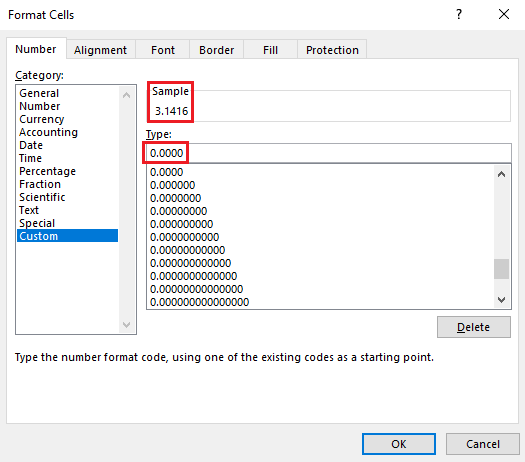 After clicking this you will get the Format Cells Dialogue box where the Number Category is selected automatically. In this box reduce the decimal places to 5. You can also open this box by pressing the Format Cells option after pressing the right button of your mouse to the cell. After selecting specific decimal places press Ok, you will get to see the below result. Note: This is the best option for rounding up numbers as you can select the decimal places specifically. To open the Custom Format, click on to the Format Cells option after selecting the cell and pressing the right button of your mouse. 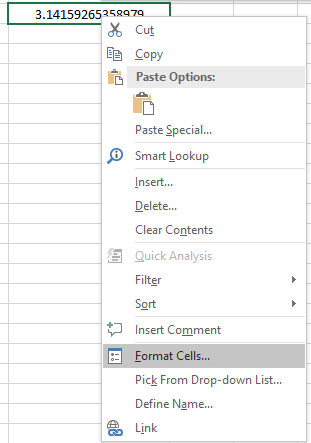 In the Format Cells option select Custom as Category. In the type option, write 0.0000 which will make the number as 4 decimal place number. You can have a Sample in the Format Cells option from which you can see the preview. Now, after pressing OK you will see the result that you want. 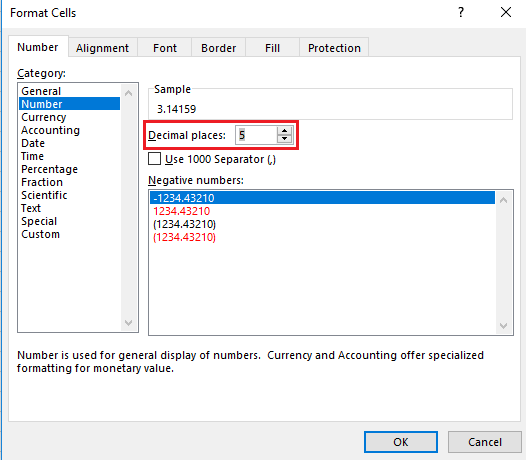 There are many ways to chop off the decimal number in Excel. Firstly, you can use the Decrease Decimal option under the Home tab which may take a bit of time. Continue to tap the Decrease Decimal button until the decimal point disappears. Secondly, you can select the decimal place as “0” to chop off the decimal point from your number. The third process is a complex one which uses the custom formatting. After selecting Custom in the Format Cells option type, “0” in the type section. You will see the decimal point gets disappear. 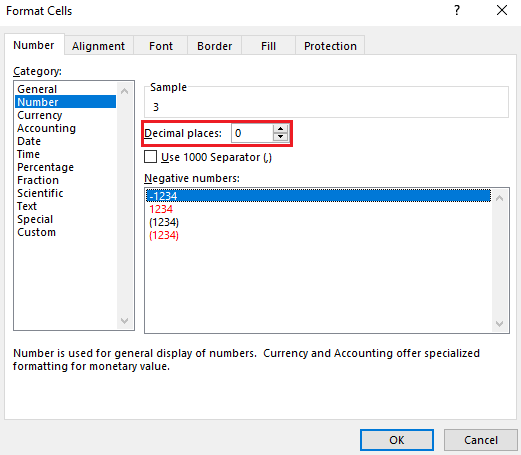 In this article, you get to see a number of processes on how to round numbers in Excel without formula. Here you also see the processes of chopping off the decimal point. Although many formulas can be used to perform these tasks, by using these built-in features you will find it ease while doing these tasks. Hope you will like this article. Follow us to get more useful articles.